The concept of frailty as a long-term condition brings with it the opportunity to adopt a much more proactive, person-centred, community-based approach to care. Achieving this requires a new approach to care, particularly through supporting self-care. This new approach will be enabled through a wider awareness of frailty and a greater shared understanding of the condition. The ‘frailty fulcrum’ is an animated model for frailty that has been developed with these opportunities in mind. This model aims to provide a ‘common language’ for frailty that can be shared between individuals, carers and professionals. It offers an interpretation of frailty that is meaningful, relevant and sustainable for people living with the condition, throughout their journeys of care. Multimorbidity (Long-term conditions), such as diabetes, heart disease or respiratory conditions. Acute health problems, including the frailty syndromes of delirium, falls, immobility, incontinence and side-effects of medication. Factors within each of these domains can either promote individual resilience or create individual vulnerability. 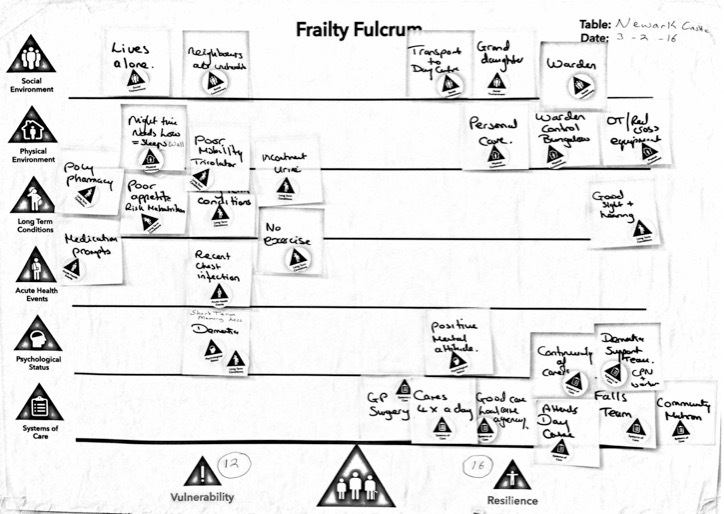 The frailty fulcrum shows how resilience and vulnerability in these various domains come together to create the holistic condition of frailty. 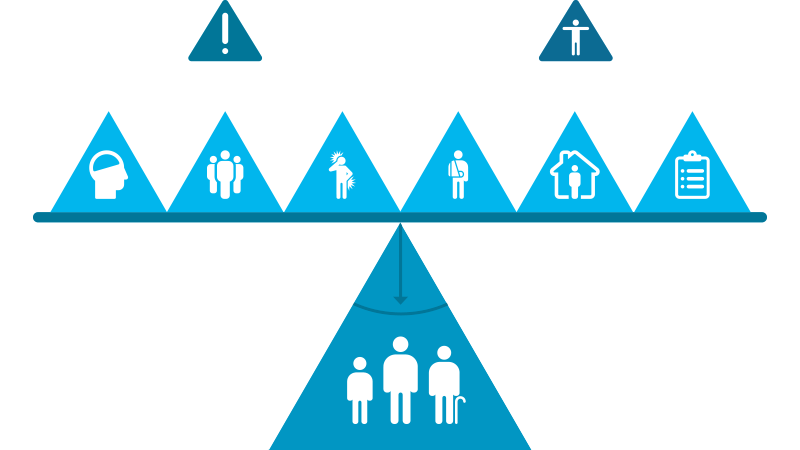 It also shows how the dynamic balance and interactions between the domains influence individual quality of life. The frailty fulcrum explains how keeping a good balance between all the different things going on in our lives becomes more difficult over time and that as we get older the likelihood of relatively small things causing bigger problems increases. The model also highlights that these changes can occur more quickly for some people than for others and therefore explains both the association and difference between frailty and ageing. The frailty fulcrum demonstrates that even though challenges in some areas of our lives might in themselves be difficult to overcome, a person’s quality of life can still be improved by promoting resilience in other areas, whatever the individual’s age or degree of frailty. It also highlights the important contribution that supporting individual decisions and choices, and supporting self-care, can make to improving quality of life for people living with frailty. 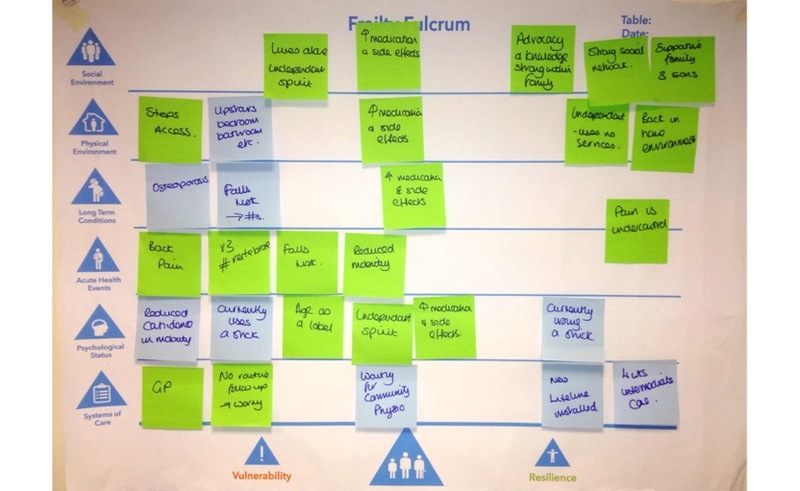 The frailty fulcrum, therefore, offers a shared language for frailty to enable a consistent approach to holistic assessment and action planning. 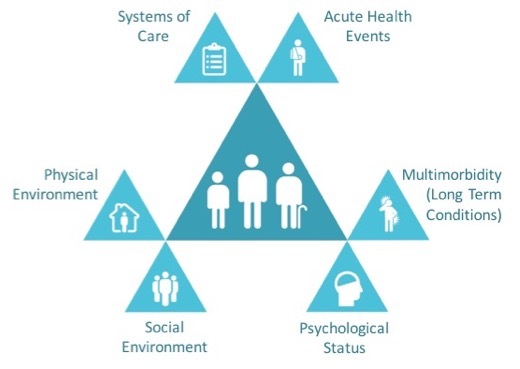 It helps to identify and understand the multi-dimensional opportunities that exist to optimise quality of life for people living with frailty and is intended to empower these individuals to exercise choice and control over the care they receive and the ways in which they live their lives.